You can replay our Q&A on Proposition 6, the gas tax repeal. Below is a lightly edited transcript of our episode on Proposition 10. If passed, it would repeal the Costa-Hawkins Rental Housing Act, which limits rent control across California. PLACZEK: But we’re here to talk about housing. PLACZEK: At the time, the state was recovering from a housing slump and construction of new housing had slowed down. That’s when two politicians decided to try to curb rent control. The politicians were Democratic Senator Jim Costa and Republican Assembly Member Phil Hawkins. Together they drafted the Costa-Hawkins Rental Housing Act. MATT LEVIN: And it passed by one vote. That shapes rent control policy across California. PLACZEK: This is Matt Levin, a data reporter for CalMatters and co-host of the housing podcast, "Gimme Shelter." PLACZEK: Now, Costa-Hawkins limits rent control in a few big ways. For example, it barred rent control on most single family homes and condos. So most of the suburbs can’t have rent control. It also barred rent control on new buildings. So if a building was constructed after the law took effect, that building cannot have rent control on it. LEVIN: You can't impose rent control on properties that were built after 1995. PLACZEK: The thing is, before Costa-Hawkins was passed, about a dozen cities already had rent control laws. And some had their own cutoff dates that had been established earlier. Those dates were frozen by Costa-Hawkins. So in Oakland, the cutoff is in 1983. Berkeley in 1980. 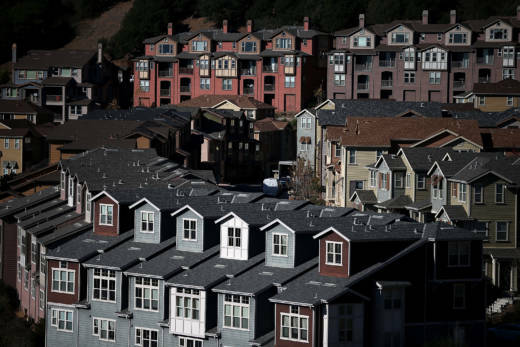 While in San Jose and San Francisco, nothing built after 1979 can have rent control. LEVIN: And so anything new and nice looking in San Francisco is not going to have rent control on it. PLACZEK: Another thing Costa-Hawkins changed: it eliminated vacancy control, which ties rent control to the apartment instead of the tenant. With Costa-Hawkins, we have vacancy decontrol, which means if a tenant moves out of a rent controlled apartment, landlords can raise the rent as high as they please. LEVIN: I see old apartments all the time. They're total pieces of crap, and they're charging like a bazillion dollars, right? But once you get into that apartment, they're limited in how much more they can raise it. PLACZEK: Today, only 15 cities have rent control in California. PLACZEK: But because of Costa-Hawkins, many units in those cities are barred from having rent control. PLACZEK: In California, more than one in five households pays over half its income on housing. People are looking for ways to ease housing costs and some are looking toward rent control. This actually won’t be the first attempt to overturn Costa-Hawkins. Earlier this year, a bill went before state legislators. ASSEMBLYMAN DAVID CHIU: This bill required 4 votes to get out of this committee, at this time there are 3, so AB 1506 fails passage today. PLACZEK: It didn’t get too far. Should California cities and counties be allowed to expand rent control? ALLEN-PRICE: Ok, so now that you understand Costa-Hawkins, we can talk about Prop 10, which would upend that legislation. Here to talk about it with me is Guy Marzorati of the KQED Politics and Government Desk. Hey, Guy. ALLEN-PRICE: So walk us through Prop 10, what are we voting on? MARZORATI: I think it's easy to look at this as a measure all about rent control. I think it's largely about local control. This is taking something, rent control, that's been dominated by state laws over the last couple of decades, and it would turn it over to individual cities and counties in California and say, "if Proposition 10 passes, what do you want to do about rent control? How would you like to govern the prices of rent within your city or within your county?" ALLEN-PRICE: So what does the prop actually say? MARZORATI: It's repealing Costa-Hawkins and taking us back to the time before that law when cities could implement their own rent control laws on an individual basis. And so you had some places like San Francisco, Berkeley, Oakland that already had rent control on the books before Costa-Hawkins. But you had the vast majority of California cities without any rent control laws. ALLEN-PRICE: So if this passes and Costa-Hawkins is overturned, what does it actually mean? Like what happens the next day? Do we suddenly have rent control everywhere? MARZORATI: No, you don't. There would be some cities that had certain pieces of their rent control that were explicitly outlawed by Costa-Hawkins. If Costa-Hawkins goes away, they can have vacancy control once again. But for the vast majority of cities nothing would change the day after the election or once the elections are certified. ALLEN-PRICE: So it's not like we're going to have a flood of rent control laws suddenly coming. MARZORATI: Absolutely not. I think here in the Bay Area there's really just been one city, Berkeley, that's put forward a measure saying if Proposition 10 passes here's exactly how we would change or how we would expand our rent control laws. They want to introduce rent control on a rolling basis for buildings. So as buildings hit their 20th birthday, they age into rent control. But for most cities they haven't figured that out. And I think what you're going to see is a lot of long public comment lines at local supervisor committees, city council committees, as cities possibly take rent control up after a possible post-Prop 10 future. ALLEN-PRICE: And, in a nutshell, what would this mean for renters in California and what would this mean for landlords? MARZORATI: So I think there's limited actual research on what rent control does. And like every housing thing, it doesn't happen in a vacuum. You have all of these other housing laws intersecting with it. I think broadly speaking, the research has shown that if you are a current renter, rent control helps you stay in your unit. ALLEN-PRICE: If you have rent control. MARZORATI: If you have rent control. And that's particularly true if you're a senior citizen and you may be on a fixed income. Rent control can help stabilize the amount that you're paying out for rent and it can help you remain in a unit. On the flip side, the evidence shows that it is a disincentive to actually build housing. If a developer is limited in the amount that they can make off of a rental unit, well, maybe they're not going to build rental units, maybe they'll just build condominiums or apartments for sale. And as we know, California has a huge shortage of actual housing units. So that's the fear. If you take away this incentive for development then we're going to worsen our shortage of units. ALLEN-PRICE: There have been a lot of rent control measures that have been on the ballots, on local ballots around the Bay Area, and I think predominantly those have not passed. Why is that and do you think that trend will hold for this statewide prop? MARZORATI: Well I think the political reality is that landlords are well organized in the state. The Apartment Association has well funded campaigns. They're very politically active. And so in the past you've seen some mixed success on local ballots in terms of rent control. Although there have also been recent rent control victories in Mountain View and other places. MARZORATI: So it's hard to say local measures haven't done as well and predicate failure for this measure. I think there's just a groundswell of energy around this idea of rent control because it's really easy to sell, to just say "the rent is too darn high." ALLEN-PRICE: You can say damn, it's a podcast. MARZORATI: Too damn high! We need some kind of solution. All that said, the political reality is California is at an all time low of home-ownership rates. We know homeowners are usually more politically active, and renters by nature are more transient. So I think that's a harder demographic to capture politically. ALLEN-PRICE: So you mentioned who is supporting this prop. Who is against it? MARZORATI: As you'd expect, developers are against it. They see this as a huge cut into their business. If local jurisdictions start to limit the amount that they can charge on rents, well then how are they going to finance these rental buildings? And maybe they're just going to go and build market rate units and condos. Developers also fear that this would create a patchwork of different rules. I think one thing they like about Costa-Hawkins is that it's a state mandate. It governs this huge market that they develop in. If all of a sudden every individual city has their own rent control laws, that can make business harder for them. So developers have been financially the biggest opponents of Prop 10. ALLEN-PRICE: All right, well it's going to be interesting to see how voters respond to this one. MARZORATI: Yes, will be interesting to see. ALLEN-PRICE: Guy Mazorati with the KQED Politics and Government Desk. Thank you. ALLEN-PRICE: If you want to know more about the Costa-Hawkins Rental Housing Act, or Proposition 10, Guy will be taking your questions in a Facebook Live on Oct. 24. You can go ahead and RSVP ahead of time so you’ll get a handy reminder when it rolls around. Get all the details at BayCurious.org. ALLEN-PRICE: This episode was produced by Jessica Placzek. ALLEN-PRICE: That’s it for Bay Curious Prop Week! Thanks so much for listening along. We hope this has been helpful and that you’ve learned a lot — I know I have. If you want to dig deeper into any of these propositions, you should check out KQED’s Voter Guide at kqed.org/elections. Next week we’ll be back to our regular schedule — dropping a new episode every Thursday. Prop Week was produced by Paul Lancour, Ryan Levi, Jessica Placzek, Vinnee Tong, Devin Katayama, Erika Aguliar and me, Olivia Allen-Price. Special thanks to Julie Caine and Guy Marzorati for their support. Bay Curious is made in San Francisco at KQED.